DENVER, Nov. 14 /CSRwire/ - Field to Market: The Alliance for Sustainable Agriculture last night announced the 2018 recipients of its prestigious Sustainability Leadership Awards. The Alliance honored Archer Daniels Midland Company (ADM), Agrible and General Mills, Inc. with the 2018 Collaboration of the Year Award and presented the 2018 Farmer of the Year Award to Louisiana cotton farmer Jay Hardwick. In their second year, the awards—presented as the capstone of the Alliance’s fall meeting—recognize farmers and organizations who have demonstrated outstanding leadership through their efforts to advance continuous improvement in the sustainability of U.S. agriculture. Recognizing outstanding collaboration and cross-sector partnership in advancing continuous improvement in sustainable agriculture at the field and landscape level, ADM, Agrible and General Mills—this year’s recipients of the Collaboration of the Year Award—were honored for their collective efforts to help farmers in the Southern Plains build soil health, conserve water and extend the life of the Ogallala aquifer through improved management. By coordinating efforts through the Southern Plains Wheat Fieldprint Project, these partners are taking steps towards helping farmers improve the resiliency of their fields, conserve water and improve their bottom line. These companies are taking important steps in helping farmers adapt their management practices to the future potential of prolonged drought, such as conservation- or no-till, which can serve as an important defense against the conditions that led to the Dust Bowl more than 80 years ago. Honoring the extraordinary contributions of a farmer who is committed advancing sustainable agriculture through outstanding conservation and stewardship efforts on their farm and sharing best practices with their peers, this year’s Farmer of the Year recognizes Louisiana cotton farmer Jay Hardwick for his leadership and dedication to sustainability. As Field to Market’s highest honor for commodity crop producers, this distinctive award celebrates Jay’s commitment to delivering sustainable outcomes for agriculture. The winners of Field to Market’s Sustainability Leadership Awards are selected by the Alliance’s Board of Directors and Awards and Recognition Committee. Each recipient demonstrates leadership in the pursuit of continuous improvement, resulting in measurable results and significant impact on both agriculture and the environment. 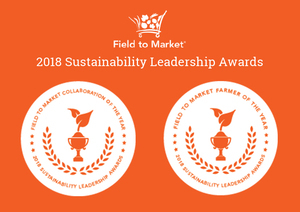 Learn more about the 2018 Sustainability Leadership Award winners at www.fieldtomarket.org/awards. Field to Market: The Alliance for Sustainable Agriculture brings together a diverse group of grower organizations; agribusinesses; food, beverage, restaurant and retail companies; conservation groups; universities and public sector partners to focus on defining, measuring and advancing the sustainability of food, fiber and fuel production. Field to Market is comprised of more than 140 members representing all facets of the U.S. agricultural supply chain, with members employing more than 5 million people and representing combined revenues totaling over $1.5 trillion. For more information, visit www.fieldtomarket.org and follow us on Twitter at twitter.com/FieldtoMarket.